The wedge-tailed green pigeon (Treron sphenurus) belongs to the family of pigeons and doves, the Columbidae. The wedge-tailed green pigeon species is distributed in Pakistan, India, Nepal, Bhutan, Bangladesh, China and southeast Asia. The green pigeon species has wedge shaped tail. These pigeons are polytypic species. The wedge-tailed green pigeon (Treron sphenurus) is a medium sized green pigeon, measuring 30 to 35 cm in length and weighing 200 to 220 grams. The overall plumage is yellowish green. The crown is coppery gold. The head and neck are yellowish green. The breast is orange-rufous. The underparts are yellowish green. In males part of the back and scapulars are maroon. The bill is pale blue with pale pinkish tip. The irises are pale blue. The legs are short and the feet dark red. The call of these species is a melodious whistling sound. 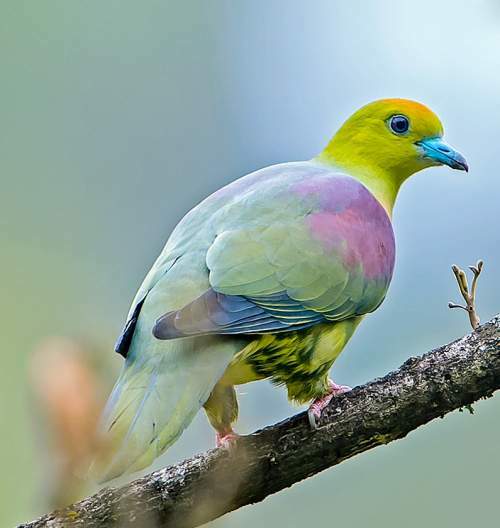 The wedge-tailed green pigeon species is distributed in Pakistan, India, Nepal, Bhutan, Bangladesh, Myanmar, Thailand, Cambodia, Laos, Vietnam, China, Malaysia and Indonesia. 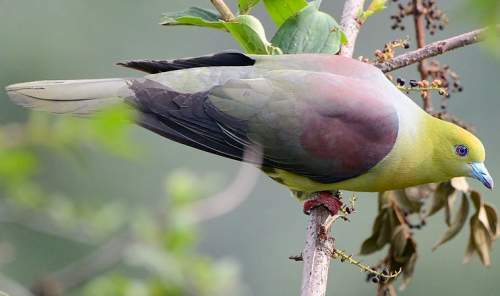 In India, these green pigeon species are distributed in the states of Jammu and Kashmir, Himachal Pradesh, Uttarakhand, Sikkim, northern West Bengal, Assam, Arunachal Pradesh, Meghalaya, Nagaland, Manipur and Mizoram. 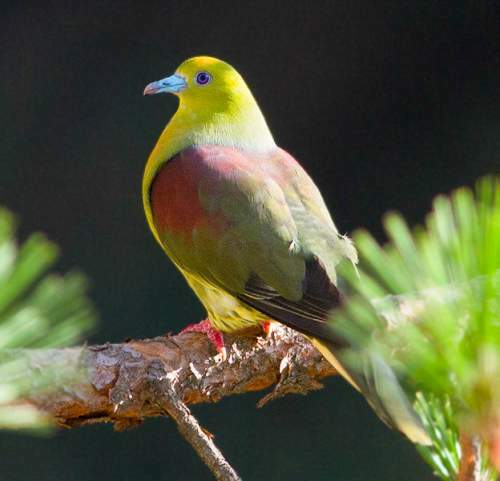 The wedge-tailed green pigeon nominate subspecies T. s. sphenurus is distributed in the mountains and foothills of Himalayas along northern Pakistan and north and northeast India, and also in Nepal, Bhutan, Myanmar, southcentral China, Thailand, Laos and northern Vietnam. The wedge-tailed green pigeon subspecies T. s. delacouri is distributed in central Vietnam. The subspecies T. s. etorques is distributed in Sumatra. The subspecies T. s. korthalsi is distributed in Java and Bali. The subspecies T. s. robinsoni occurs in Malaysia. These wedge-tailed green pigeon species have moderate forest dependence. They normally occur in altitudes from 1000 to 3000 meters. The natural ecosystems and habitats of these species include tropical and subtropical dry forests, broad-leafed forests, tropical and subtropical moist lowland forests, second-growth forests, foothill forests and montane forests. The diet of these wedge-tailed green pigeon species consists mainly of fruits. Wild fruits, berries, figs and mulberries are their primary food. They normally forage in the understory and middle story of the forest. The breeding season of these wedge-tailed green pigeon species is from April to August in India. Sometimes a second brood is raised. These species are monogamous and there is elaborate courtship. The nesting sites are located on fork of tree branches. The nest is a flimsy platform of sticks, twigs and leaves. The clutch contains two white eggs. Both the parents incubate the eggs and take care of the young. These wedge-tailed green pigeon species are non-migratory resident birds. They disperse locally after breeding. The populations in higher altitudes descend to the lower levels during winter. Post breeding, the juveniles may disperse and establish in new locations within the range. Within their range they may make local nomadic movements for feeding and breeding. The global population size of the wedge-tailed green pigeon (Treron sphenurus) has not been quantified. The overall population trend of the species is considered to be stable. In most of its range, this species is reported to be common to uncommon (del Hoyo et al. 1997). The generation length is 4.2 years. Its distribution size is about 9,880,000 sq.km. Habitat alteration and destruction, deforestation and capture of adults and juveniles for pet-trade are the main threats that are endangering the survival of these species. The wedge-tailed green pigeon (Treron sphenurus) does not approach the thresholds for being Vulnerable, either under the range size criterion, or under the population trend criterion or under the population size criterion. The CITES (Convention on International Trade in Endangered Species of Wild Fauna and Flora) status is ‘Not Evaluated’ for the wedge-tailed green pigeon (Treron sphenurus). The wedge-tailed green pigeon (Treron sphenurus) is closely related to white-bellied green pigeon (Treron sieboldii), Ryukyu green-pigeon (Treron permagnus), pin-tailed green pigeon (Treron apicauda) and whistling green pigeon (Treron formosae). The five recognized subspecies of wedge-tailed green pigeon are: T. s. sphenurus (Vigors, 1832), T. s. korthalsi (Bonaparte, 1855), T. s. etorques (Salvadori, 1879), T. s. robinsoni (Ogilvie-Grant, 1906) and T. s. delacouri Biswas, 1950. Current topic in Birds of India: Wedge-tailed green pigeon - Treron sphenurus.